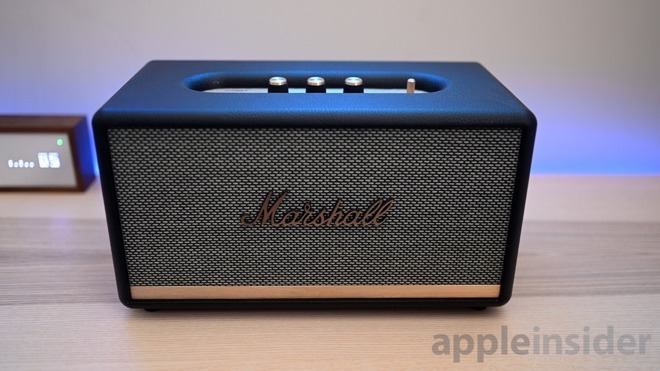 We've taken a look at Marshall's speakers in the past — including the AirPlay multi-room version of the Stanmore, as well as the Acton. There is also the portable line, made up of speakers with batteries that don't need tp be constantly tethered to an outlet such as the recently updated Kilburn II. Stanmore II falls right in the middle of the company's Bluetooth wall-powered speakers lineup, between the Acton II and the Woburn II. The original Stanmore speaker was well received, with an iconic sound, only held back by a slightly inflated price tag. 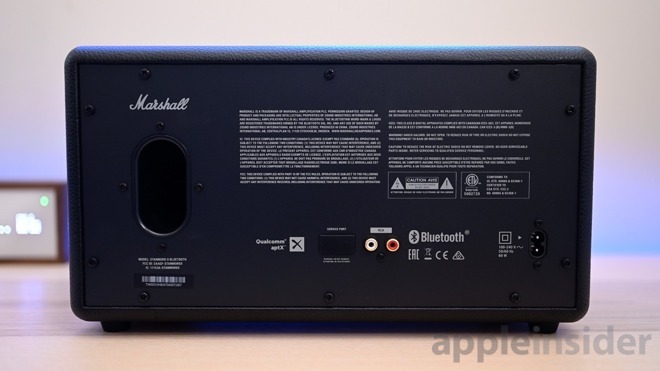 For this incarnation, Marshall took time to improve on what was already a powerful sounding speaker including the audio quality, as well as the feature set. 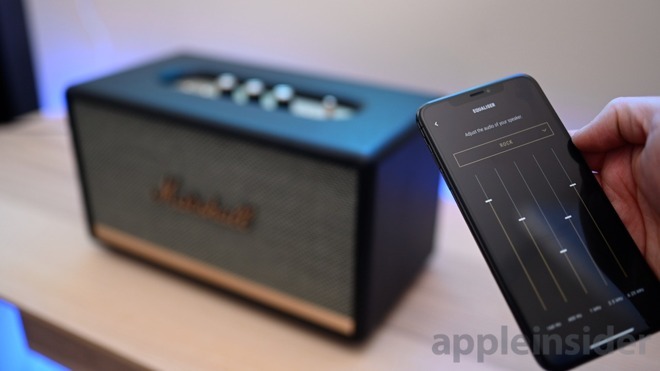 Now, the speaker can be controlled by the Marshall Bluetooth app where multiple speakers can be coupled together into a stereo pair. Volume, EQ, and firmware can also be adjusted from this connected app. Inputs can be cycled through, making it far easier to go from Bluetooth to RCA without having to approach the speaker. Marshall also slightly updated the appearance, fine-tuning the details but keeping what worked the first time around. Sitting at almost 14 inches wide, the Stanmore II is not a tiny speaker. It will easily fill a room with its capable sub and dual tweeters hidden behind the fabric grille. Speaking of the grille, like the giant amps scattered across the stage at a concert, Marshall's iconic script wordmark is front and center. Vinyl encompasses the exterior, while brass plates accent the top and front. Unlike the original, the knobs are now rubberized, but still have metal caps along the top. Marshall replaced the beloved power toggle for a new spring-loaded lever with knurling added for grip, which isn't a terrible trade-off. The likely reason for the change in the power switch is because of the new control via the iOS app. With a physical on or off position, it couldn't be controlled remotely, but an lever that returns to a set position regardless of power status can be changed in software at any time. Around the back of the cabinet, there is a service port, power input, and a white/red RCA input. Not much went into the back design of Stanmore II, but luckily it works best against a wall where the bass can ricochet off the flat surface. Once you power up the speaker for the first time, you'll likely be prompted to install a firmware update. 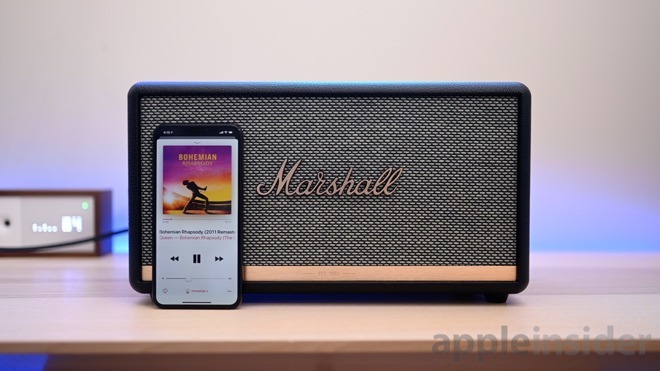 It only takes a few moments to get through and can happen from time to time as Marshall continues to improve the speaker. 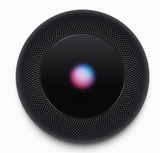 After the update is installed and the speaker has rebooted itself, you can use the app. The app actually looks fairly sparse and will probably collect digital dust on your iOS device sans for the few times it comes in handy. Once you've set the EQ to your liking, it will probably stay, unless you jump between the different presets — such as rock, pop, etc — often. We found ourselves initially setting a preset, but then tuning it ourselves based on our liking. If you happen to have two of Marshall's newer Bluetooth speakers, the app allows you to couple these together into a stereo pair. Plugging your TV into the RCA port and then wirelessly connecting to the other could prove a capable — if not expensive — sound system. Marshall has always been known for its iconic sound —a slightly gritty, powerful profile that is most tuned for its genre of choice. Rock is clearly that target here. Stanmore II sounds strong, with substantial room-filling bass but not overwhelming like speakers designed for pop and rap. We ran through our normal testing tunes and generally were pleased with the performance. Queen's Bohemian Rhapsody shined the most with the Stanmore II able to traverse the multitude of musical tones throughout the song. As we cranked the volume to the max we started to notice a bit of distortion but was so loud we didn't keep it there long in our small-medium room. Compared to the original Stanmore, there is a definite increase in the fidelity of the audio. Also like the original, the EQ isn't incredibly substantial. 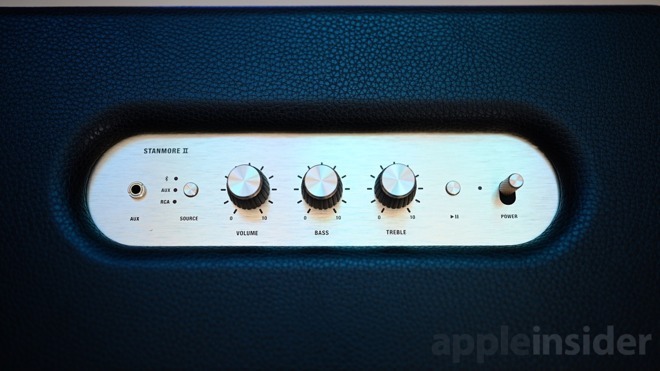 The bass and treble knobs are there to perfectly adjust the audio to your liking, not for providing a huge shift in what the speaker is capable of. We like having them, but don't think you will get a floor-shaking amount of bass just because you turn the knob to ten. For all that we love about the Stanmore II, there are some deficits we can't easily overlook. The packaging feels just slightly cheaper, using a thin foam wrapper rather than the fabric dust cover included prior. There are also no additional cables to be found. 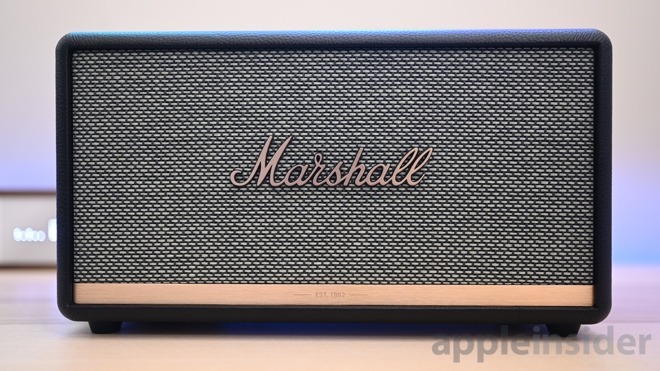 With their original line, Marshall included brass-accented aux cables making it easy to plug your devices in. To be entirely fair to Marshall, many phones are now shipping without headphone jacks making this cord unnecessary, but for the price we've have preferred this be thrown in. Compared to the Woburn II, the Stanmore seems slightly overpriced —but not by much. Woburn II just seems a better value for what you get. If you can swing the extra change, opt for the Woburn. If you have to "settle" for the Stanmore, you won't be disappointed. Stanmore II puts out more than enough sound for most rooms, looks great with a classic retro vibe, and has excellent sound quality for a speaker in this range. There are downsides, as most speakers have, but not enough to turn us off of this rock legend. You can grab the Marshall Stanmore II from Amazon for $349.99. The even larger and more powerful Marshall Woburn II for $499.